Udon is a type of thick noodle popular in Japanese cuisine, usually made with wheat and is served hot as a mildly flavoured noodle soup. The origins of this noodle was inspired from a type of noodle in China called “cu mian”, where the recipe was brought over to Japan and improved by Buddhist priests by the name of Kukai, Enni and Hakata who travelled to China during the 9th century to study Buddhism. You can see this noodle a lot in Japanese restaurants from as simple as the kake udon which is only made out of dashi, soy sauce, and mirin to something like this post where it consist an array of seafood ingredients. A very light but flavourful noodle dish that is a must try for seafood lovers. I still remember the first time I tried this one it was in Mövenpick – Marche restaurant in Hong Kong’s Victoria Peak, and since then I fell in love with this dish. Funny enough that this is a Japanese dish but I had tried it in a Swiss restaurant. Cook udon noodles according to instructions then set aside. In a pot add the water and dashi stock, bring it to a boil. While stock is boiling add mussels, once they open remove it with slotted spoon then set aside. Add the shrimps, salmon and scallops into the boiling stock then remove them using a slotted spoon once cooked. This will take a few seconds. Add the sake and mirin then simmer for 3 minutes. Season with sea salt and freshly ground black pepper. Place cooked udon noodles in bottom of a soup bowl then place the cooked seafood and a handful of spring onions on top. Pour boiling broth then serve with chilli flakes and shredded nori sheets. This soup looks beautiful…I must try it out! Salmon inside the broth is awesome, was suggesting to my hubby the same in noodles soup and he did not seem interested. I absolutely love udon and I think I am able to get these ingredients! Exciting! udon is yet another new ingredient that I have learned about via your blog, and I like that I am expanding my ingredient knowledge *and* getting a recipe to use it in. Thanks! 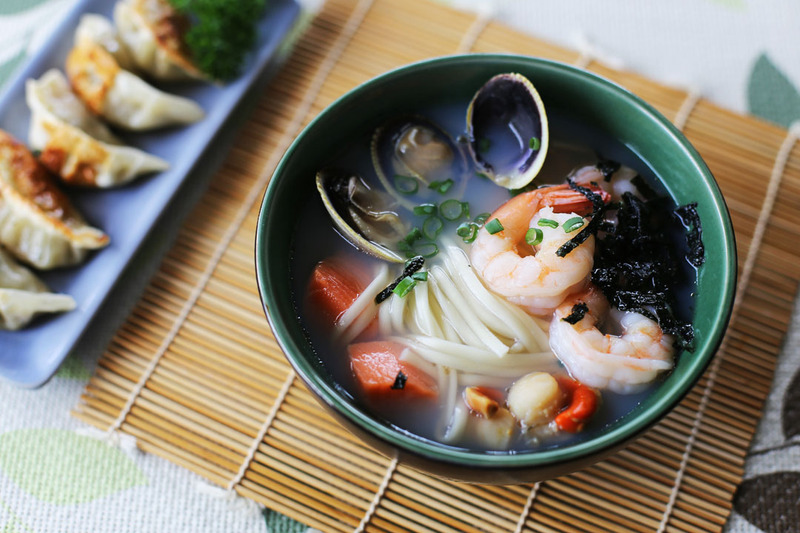 Thanks for this post… A good Udon soup (this seafood one is great) is an all time favorite of mine. There are so many additions I love depending on my mood (e.g., even a poached egg)… regardless personally love to finish it off with some spice table side… because I am just one of those that need heat in my big bowls of Asian soups. Again great post! 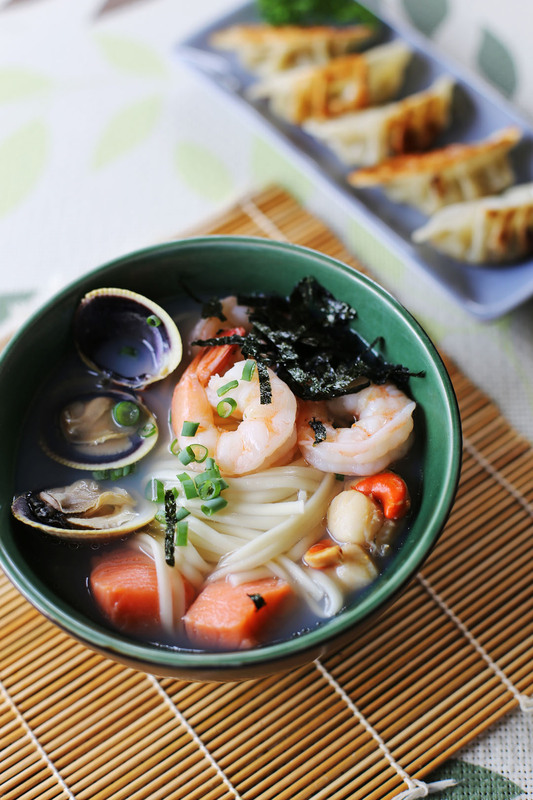 Udon soup is delicious and your recipe definitely has great ingredients. Many variation possibilities too which is great. Enjoyed the background history about the dish, very interesting. Nice photo! I have had this soup before and loved it. Any kind of fish IMO goes great w/ it.